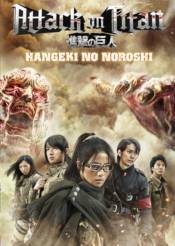 ATTACK ON TITAN: HANGEKI NO NOROSHI is a three-part live action mini-series - presenting stories of the Survey Corps members that take place between the events in ATTACK ON TITAN and ATTACK ON TITAN (PART 2): END OF THE WORLD. In the first story, while developing the ODMG, Hans secretly conducts experiments to learn more about the Titans. When a new recruit sneaks into Hans' lab, he realises these experiments are deadlier than anyone could have guessed. In the second story, Sasha must solve the mystery of an unknown boy whose appearance has caused a series a strange incidents!